I stood at the rest area on I-75 staring at three doors, each with a different placard – women, men, family. Now, I believe in family vacations, family dinners and the family getting together to clean the garage that I messed up. I believe in family picnics, family game nights and family reunions. I believe families should spend holidays together, especially if they want a gift and that as one, they endure school plays and beginning band concerts. 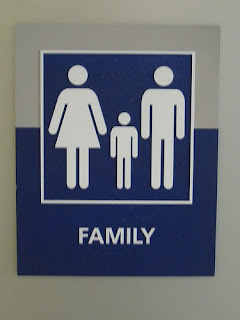 However, I draw the line at families taking a dump together. Some things were just meant to be done alone without the benefit of a family member talking to you the entire time and urinating into a porcelain bowl is one of them. The second half of the definition made more sense; at least it did for hair products. For restrooms, I’m not so sure. “Suitable or designed for both male and female.” To be honest, all restrooms are suitable for either gender. It’s just that the sexes don’t wish to go wee-wee together and I’m okay with that. Besides, a unisex restroom translates into public quickie spots for those who want to do the nasty in public potties. 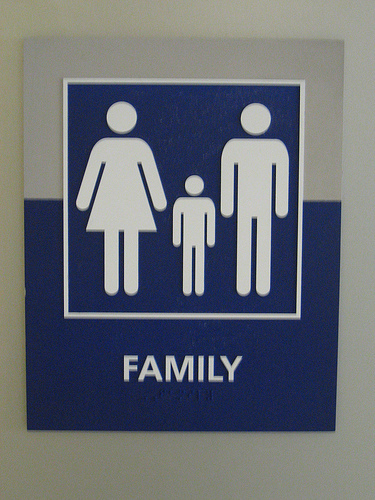 Still, I know the real reason for family restrooms. It was all part of the women’s movement that said men will change dirty diapers in public. At one point in history those hard plastic fold down stations were only seen in women’s restrooms. That, it was decided, was totally unequal and a decree rang out in the female population that placed the changing tables in men’s rooms so that men would change their kid's diapers or at least try to. I remember the first time I walked into a public restroom and saw the white plastic table with the cute little baby picture on it and straps dangling to the floor. I stood staring at it, dumbfounded, thinking some poor employee screwed up and place the contraption in the wrong room. Somewhere a baby was being changed on a grungy tile floor. A man walked out of a stall and stood beside me, also gawking at the contraption that had invaded male territory, taking the place of those flavored condom machines. “This does not bode well.” I agreed with him and then looked up the word bode. He was right. I was surprised that the table was equipped with normal straps and not duct tape or bungee cords. It didn’t look like a man’s contraption at all, which probably would have been constructed out of plywood with a beach towel stretched on it so little junior could keep splinters from his tushie. It did come with the instruction “Do not leave baby unattended.” Men don’t read instructions, so I figure someone had tried it once, strapped the baby down and zipped over to Starbucks for a peaceful latte without the sniveling drool. What it didn’t come with were instructions on how to change the diaper. I needed that little tidbit of information. 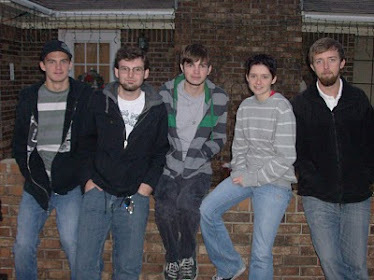 With three sons I had only changed three diapers and only one of them belonged to a child of mine. Stop looking at me like that. Char decided when we were first married that she would rather clean one mess instead of two. The first time I changed Nathan’s diaper it took over twenty minutes because my stomach doesn’t like smelly, dirty messes. I would have to peel off one of those sticky tabs, step back and gulp several deep breaths and then step up, holding my breath, and peel off the other. I will say, however, that I never left the child unattended and the straps worked well. Flasks are pulled out and passed around, cigarettes are smoked and there’s a dice game going on in stall three. It’s truly a room of rest. We don’t have to be tidy and we can burp and fart all we want. Family restrooms will abolish all of that with air fresheners and doilies on the counters. Furthermore, the women will know there’s not really a line to the urinal that took twenty minutes. And, of course, none of them ever will because we’ve done a superb job of telling them how disgustingly filthy a men’s public restroom is. They see how bathrooms need to be condemned at home after taco night and so they can’t even fathom the destruction of a men’s room at the mall with lousy aim after lousy aim. Usually a boy with a flatulence problem is stationed by the door which sets up an odor perimeter most women won’t infiltrate no matter how bad their curiosity. I believe in equality in practically everything. 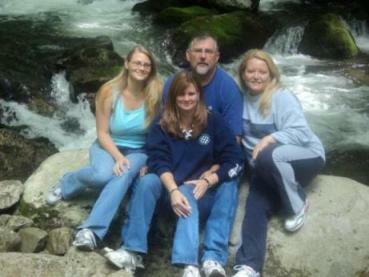 I am a firm believer in family, but I draw the line at family outings to the privy. I need the peace and quiet.